Mix the flour and salt in a large bowl. Make a well in the center. Into the well, put the sugar, eggs, rum and butter. Stir the center first, to mix all the wet ingredients, then work in the flour, till you have a stiff but workable paste. I tried to use my hands to mix everything, and it got pretty messy! It’s an option, though! Put the dough in the fridge for at least an hour to set and rest. Preheat the oven to 350. Butter and line and foil an 8 or 9 inch cake pan. (I never buy parchment paper, but I’ll break off a rectangle of foil 6 or 7 inches wide, fold it in half smoothly, and butter that into the bottom of my pan. Then put a bit of butter and flour over it. Keeps the cake from sticking! Take 2/3 of the dough. Roll it out to be just a bit bigger than your pan. It will be very sticky – you’ll need lots of flour on the counter and your pin. You could actually just roll it to sort of the right size and then use your hands to mold it. Basically, you want the dough to line the bottom and go up the sides. But not like a pie crust – it can be quite thick, and that will be fine. Mix your jam (or jams) with your cassis or rum. Stir to make it spreadable. Spread it into the cavity in your bottom 2/3 of dough. Spread the chocolate covered cherries over. It should form an even layer. If you have extra – eat them!! Roll the remaining 1/3 of dough to be about 1/2 inch thick – and wide enough to fit over your cake. Place it on top. If it seems uneven or breaks, don’t worry, you can mold it back together later. Brush the top with a beaten egg yolk, and then use a fork to make a pattern in. I’ve read that the different patterns told you what was inside. Criss cross meant pastry cream, and a Basque cross meant jam. 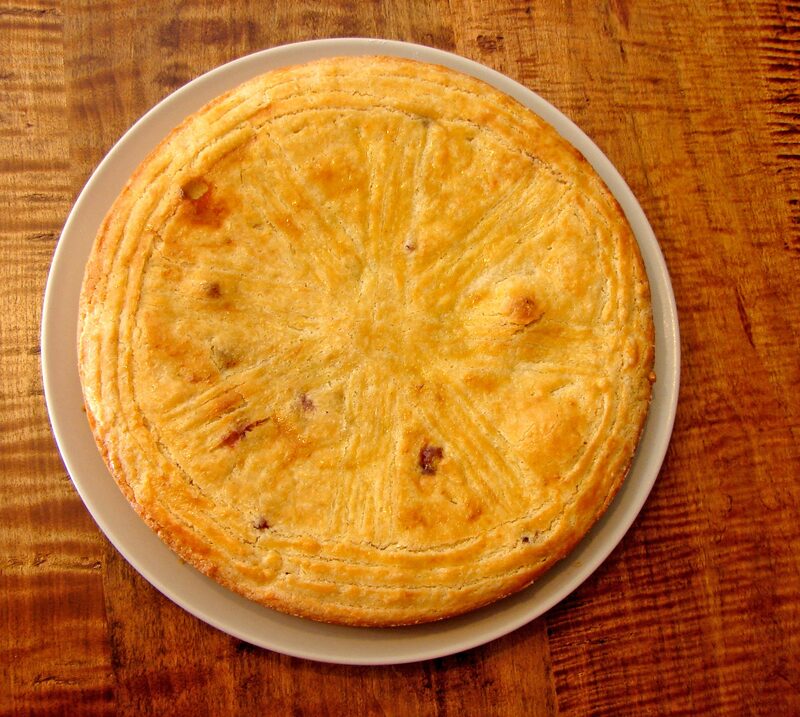 I copied the one in Cuisine moderne et vieilles recettes, which was a circle around the edge, and a quadruple (Sextuple) cross inside. I’m not sure if looks like a Basque cross, but hopefully it signifies that we’ve got jam in there!! Bake for 30 to 40 minutes, until the top is starting to brown, and doesn’t yield to your touch. Let it cool before you cut into it. 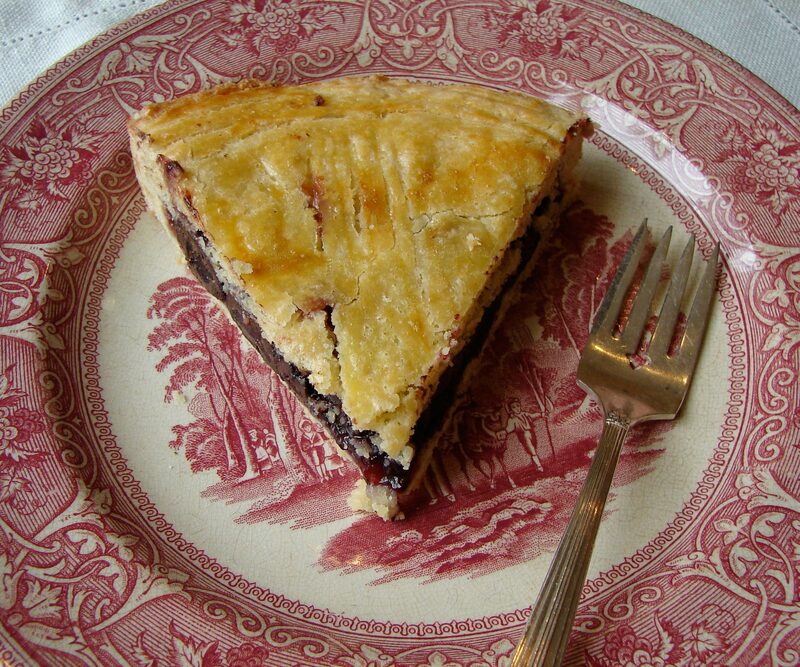 This entry was posted in cake, chocolate, recipe and tagged blackcurrant, chocolate covered cherries, dried cherries, gateau basque, quince by Claire. Bookmark the permalink. Wow, Claire – this sounds amazing! This always happens when I’m about to go on holiday though. I’ll have to leave myself a note to remind me to make it when I get back. I had to try them when I saw them too and it’s kind of like white chocolate – I think I’m ieucfnnled by the color. Chocolate should be brown and cherries should be red or they don’t take the same. I know. Neurotic. Makes a pretty picture though! are a cheap alternative that occasionally works. Why should you waste money on a security system when you can buy a dog. occur within a couple of hours. “I don’t speak French at all, really, but I studied it in high school and college, so I recognize some words, and then I’ll use google translate to try and understand the rest. Hilarieux! Moi je l’aime! Or quelque chose. Or sumthin. I’d love to know what the original French was that Google so helpfully translated. 🙂 Think I’ll go to Google translate, put in your English results and see quoi Fronch Google returns pour moi. Yeah . . . don’t think that was the original recipe! 🙂 Then again, in a culture with many strange – no, wait: Strange with a capital ‘S’ strange – eating/culinary traditions – maybe you’re actually supposed to follow those instructions. If you “boil it under the wall” it might result in a nuanced scent of truffles and carefully crafted mold-y cheese stank. So French!